In our podcast about the vegan pledge we talked about reasons that people did or didn’t decide to remain vegan after the vegan pledge including the tricky issue of biased respondent samples. The followup questionnaire was given after a month of the vegan pledge and people who fell off the vegan wagon were unlikely to make it to that meeting. In this blog I’m going to talk about how reasons that people cite for going vegan might influence whether they are choose to continue after the pledge and the paradoxical effect of unsupportive friends and relatives. 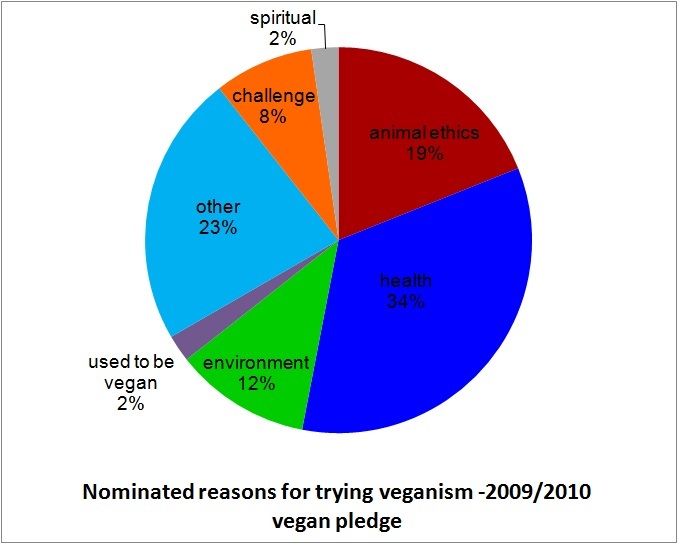 In 2009 and 2010, the pledge questionnaire administered at the beginning of the pledge asked people to nominate reasons why they decided to go vegan for the month. I broke these reasons down into categories. 93 participants nominated a total of 132 reasons; here is a pie chart of the breakdown. Interestingly, health was the number one reason. “Other” comprises lots of reasons including some that were rare (e.g. girlfriend pressure) and most that were vague (e.g. wanted more info; I don’t think I need animal products; get ideas). One reason health might have been such a big factor in this dataset is because London Vegan Campaigns specifically advertised the pledge to help pledgers learn more about health and lose weight. Only a couple of the nominated reasons appeared to have an effect on whether participants who showed up to the last meeting said they were going to stay vegan, which nearly 70% of participants said they would. Ethics was nearly significant with 84% of participants nominating this reason deciding to stay the course whereas those who viewed it as a challenge/experiment came out at only 33%. Two factors that have very small numbers but were interesting: all 3 participants who said they had tried to be vegan before decided to stay vegan after the pledge (proving that ex vegans aren’t irredeemable!) whereas only a third of those who said they wanted to be vegan for spiritual reasons stayed vegan, call Richard Dawkins. At the end of the pledge, participants also nominated reasons for completing the pledge and/or staying vegan and in this instance animal ethics was mentioned substantially more than at the beginning. (2011’s dataset isn’t so interesting because pledgers just rated the importance of health, environment, and ethics and most of them rated all three with the highest importance so there’ s no variance to work with). As we mentioned before on the podcast, the vegan pledge sets up pledgers with a “buddy” who can provide advice and support. Pledgers who rated their buddy support more highly were more likely to stay vegan with one person specifically faulting their buddy with their decision to drop out. In 2011, about a third of the 108 participants had a friend or family member who was vegan but this didn’t predict how likely a pledger was to remain vegan. Only a small minority of the pledgers from all three years (2009,2010,2011) had a friend, spouse or relative do the pledge with them. What might you predict about the impact of social support on whether or not people chose to stay vegan? This was our most surprising finding. Six pledgers in 2009/2010 who mentioned “unsupportive people” as a challenge during their pledge (e.g. “friends winding me up”; “people’s attitudes”) and all 6 of these pledgers decided to stay vegan at the end of the pledge and 3/3 who answered the one year followup were still vegan. In 2011 pledgers were asked at the end of the pledge about how difficult various challenges had been including “other’s attitudes” rated from 1 (very easy) to 5 (very difficult). 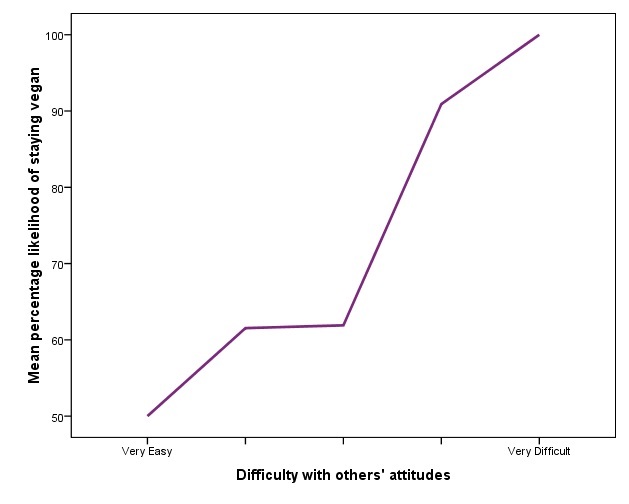 Those who found other’s attitudes more difficult were more likely to stay vegan. Out of 49 pledgers, 13 gave a rating of 4 or 5 on the difficulty of other’s attitudes and all but one of these (92%) chose to stay vegan. Why might those who found friends and family least supportive be the most likely to stay vegan? One obvious reason might be a third variable. Those who were most passionate about being vegan were most likely to stay vegan and also to have disagrements with others. Another reason might be that those who had trouble with lack of support or others’ attitudes became more committed to being vegan to better integrate with a new social community. Why do you think we found this effect? And, if you’re a meat eater hoping to dissuade a friend or relative from staying vegan, be very accepting and supportive! Thanks again to London Vegan Campaigns letting me analyse their data for them. Thank you for alerting us to this research (and to Vegan Soapbox for alerting us to your post). I believe the finding is due to the more committed vegans being more likely to extoll their values to others and therefore face more conflict than others. Wishy-washy vegans are unlikely to proselytize, it would seem. For more on vegan/vegetarian, please see http://www.humanespot.org/browse_db_by_issue/10.